How long have you taught restorative yoga? 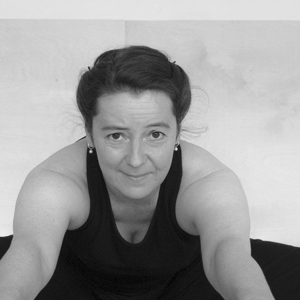 I have practiced restorative yoga for 7 years and started teaching restorative classes and workshops 3 years ago. Going to my first restorative class was like a revelation, I was stressed out at the end of a busy Monday at work and I was asked by the teacher to lie back over bolsters, with lots of cosy blankets and a stove roaring in the corner of the studio. I soon realised that in spite of doing daily yoga, I was still pushing myself rather hard – our Western approach to yoga is, like everything else, often focused on ‘doing’, ‘striving’ and ‘looking the part’. In a restorative class you are finally asked to let go of everything and are truly allowed to rest, something a lot of us have forgotten how to do. As such, restorative yoga can be quite challenging at first – when you finally stop, you realise how busy your mind really is. But through the practice you can find stillness and with that the greatest capacity for deep relaxation, true well-being and growth. What are the benefits to students attending restorative yoga classes and workshops? The benefits are multiple; when the body is deeply relaxed, the nervous system can start to restore itself. With the accompanying body-based mindfulness exercises we can start to connect with our direct experience which in turn helps us to start seeing new perspectives on challenging situations, especially when practiced over time. Restorative yoga has been shown to decrease the stress hormone cortisol, and can also help fight depression and fatigue. It is good for releasing muscles and joint pain, IBS, insomnia, to name but a few. Do people need to have done other types of yoga to try restorative? Anyone can do restorative yoga, you don’t need to be a yogi, you do not need to be sporty, nor do you need to be fit. In fact, restorative yoga was originally developed by K.S. Iyengar, a father of the modern yoga tradition, for people who were injured, ill or overworked. Restorative classes have grown immensely in popularity over recent years and continue to do so. What do you enjoy most about a restorative yoga class? I love how the energy in the room changes over the hour. Everyone comes in from the busy hustle and bustle outside and within 20 minutes everyone looks sleepy and relaxed. What is unique about your restorative yoga class? I am also a Nuad Thai Yoga practitioner, also known as traditional Thai Yoga Massage and this energy work training has deeply influenced my teaching. In addition, my background in contemporary dance and many years of somatic practice also flow into my restorative yoga classes and workshops. I always make sure to bring in some specific mindfulness, meditation and breathing practices. Last but not least, I am trained in Yoga Nidra, also called yogic sleep, which is said to invoke one of the deepest possible states of relaxation – to close a restorative class with yoga nidra has the ultimate re-balancing effect. How should a restorative yoga class and workshop make a student feel after class? What are the main reasons people do restorative yoga? Some people come to create space and mindfulness in their busy or stressful lives, others come to address specific issues or illness, like chronic fatigue, ME or insomnia. Yet others find restorative yoga to be the perfect yin practice as a balance to the active yang yoga practices, like Ashtanga or Hot Yoga. What is your favourite restorative yoga pose? Oh gosh, this is difficult, as I have a few favourite ones, like supported child pose or side twist, but the ‘bees knees’ for me is Reclining Butterfly, where your whole body is propped up and supported and your heart centre gently opens – you feel like the Queen bee on a summer’s evening in this pose and most people don’t want to come out of it. Saturday 12th November 5pm-7pm –read more or book here. Saturday 10th December 5pm-7pm – read more or book here. Find out more about our range of classes and workshops using the links provided.